What just does not come to mindSkilled craftswomen! Their skillful hands have already reached the simple plastic spoons. After all, at least once they were on a picnic and ate with disposable spoons. So, it turns out, with the help of "Dinners"You can make realWorks of art - roses and daisies. Flowers from plastic spoons decorate your favorite shelf or chest of drawers, they can be put in a vase on a table, or make a real ikebana. By the way, such crafts can be found with your kids if they are 3 years old. Kids will be passionate about making petals and helping you collect the buds of roses. 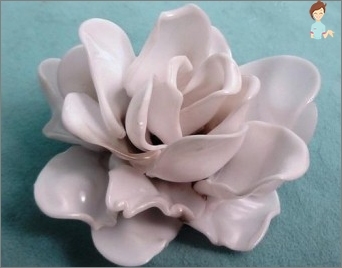 From disposable spoons, with your own hands, you can make roses. For this you will need, directly, the "Scoops", A candle, a green"Paper goffer", The same color insulating tape, artificial leaves and a vase. You can not do without Glue gun. One spoon leaves 11 spoons (leave one untouched, and the rest remove the pliers handles). Thus, you will get 10 cut off "Ladies". Light your candle and hold over its flame a "one-time instrument" (with a groove upwards). When it warms up, the plastic will twist a little. It is important not to lean "Ladle"Close to the flame, otherwise it will turn black or do not burn. Keep "Scoop"In a small distance from the fire (how to do it, you can see in the photo). Further we do the following: we take the second "tool"And heat it over the flame of its edge. Using pliers, twist the edges so that the spoon looks like a bud "Queen of flowers". In exactly the same way follows "handle" several Yet "Scoops " (The dining instrument with a handle will act as the stem of our flower). Then it is necessary to proceed to the formation of "The second echelon»Petals. To do this, take "One-time tool"And keep it upright over the fire. When you remove "Scoop"From the flame, pull its edges with pliers in the direction down. It is necessary, while holding (in this position) our "Dinette", Until the complete cooling. If you are not satisfied with the appearance of the resulting lobe, you can take a new "Ladle"And try again. You will need 4 such petals. 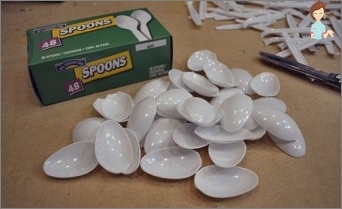 The third "echelonThe petals should be collected using 5The remaining spoons. As you can see on a real, vibrant flower, its petals are very twisted and as if descending. The same shape should be given to dinner appliances. Heat the spoon and use the pliers to form the final petals. When all the necessary parts for the bud assemblyWill be prepared, you will need to use a glue gun. Take a spoon, from which we left the handle and put on it an adhesive compound, tightly pressing to it a second petal. You will have a bud with a leg. As if surrounding the bud, we glue 4 petals "The second echelon". And here you will need to imagine in your imagination a living "Queen of flowers". Remember? Her petals fit tightly to each other. The same effect you need to achieve in the case of spoons. Further, applying the adhesive composition of the pistol to the remaining details, we collect the rest of the rose and, oh, a miracle: you will get "Queen of flowers"Almost like real! If you want your rose to be elongatedStalk, you can use a glue gun to attach to it all the cut off handles spoons. Then you will need artificial leaves, surrounding the bud (they are also called sepals). Wrap the electrical tape of the flower stalk and add the leaves. 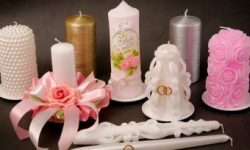 Well, now, to give naturalness to the stem of a rose, you can wrap it with corrugated paper sheets or a ribbon, which florists use in their business. And here you have the most beautiful "Queen of flowers", Which can be a real decorationFurnishing your apartment. 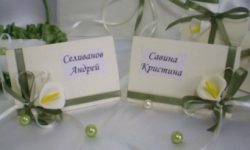 In general, flowers that can be made from plastic spoons or forks with their own hands: can be not only excellent crafts, but also real jewelry. Can I make my own brooch-flower fromPlastic spoons and forks? The answer is yes. For example, according to the technique described by us it is possible to make simply smart brooch-rose, simply having fastened to a bud a pin. Agree, such an ornament, made by own hands, will not be ashamed to attach to the blouse, putting it on the stage or at the cinema. You can see a photo of simply magnificent colors from disposable plastic spoons. They fill your soul with new ideas. After all, flowers from spoons are crafts that require ideas and imagination. In the spring, the sun shines brightly, the snow melts andThe nature is renewed. And at this time tulips, tender, charming flowers bloom. How to be, if the spring is still far away, and you want to see the tulips so much? There is a way out: these buds can be collected with the help of disposable spoons. In fact, the spoons themselves. Overlapping "Scoops"(First cut off the pens, as inCase with roses) on each other, we solder them with a soldering iron - so are the buds. From the yellow plate we make stamens, fixing them on a skewer. In the center of the bud, we make a hole with a soldering iron and put it on "Stalk with stamens"Our bud (the design can be glued, for a forest of confidence). Then you need to assemble the bottom of the tulip: The cocktail tube is cut at the point where it is bent. We make a sheet from a green plastic bottle. We attach the sheet to the tube, having melted it in the flame of the candle and our stalk is ready. By the way, if you are unhappy with the color of the leaf, then it can be painted with usual green acrylic paints. We attach the stalk to the bud with stamens, andLuxurious tulip is ready! You can collect a whole bunch of such tulips to put it in a beautiful vase on your bedside table. Spring will smile at you, giving a good mood, which is inherent in charming tulips. 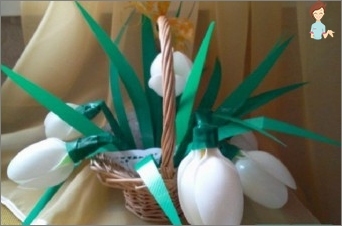 Flowers that can be gathered from plastic spoonsAnd crafts from forks - it's such an exciting activity that you certainly will not remain indifferent to it. 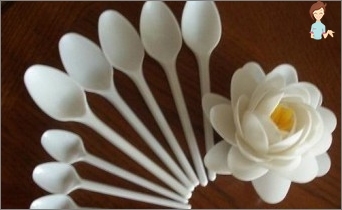 Now you know how to make a flower from plastic spoons yourself. 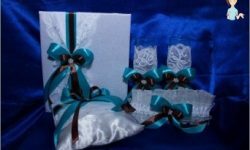 Enjoy your needlework!